Grocery shoppers are getting a gift ahead of Thanksgiving with the lowest turkey prices in the past 10 years. Purdue University’s Jayson Lusk, a professor of agricultural economics, said turkey prices will average about $1.45 per pound this year, on par with or lower than the past several years. While that’s good for consumers, it’s news farmers take with a bit of conflict. Lusk says the depressed national agricultural economy, compared with five years ago, is to blame for lower prices. Cranberries are 30% cheaper than five years ago at about 50 cents a pound. Flour is comparable to last year at about 50 cents per pound. 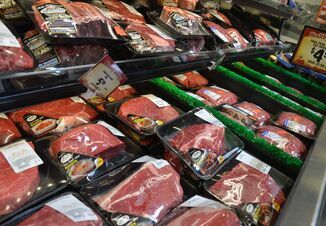 Low food prices can have ripple effects, Lusk adds. Savings on Thanksgiving dinner can be used for additional holiday shopping, or consumers might choose to “upgrade” to more expensive food choices, such as local or organic sources. 46 million turkeys are eaten each Thanksgiving, 22 million on Christmas and 19 million on Easter. In 2012, the average American ate 16 lb. of turkey.